City Methodist Church, 577 Washington St. (empty for years) stands nine stories tall. The Church made unique use of commercial and office space, classrooms, meeting rooms, an auditorium and a large sanctuary. Storefronts (visible in this picture) were incorporated into the building. The building still stands, but is in desperate need of stabilization. One architect has offered plans to turn the church into a "ruins garden" like those found in Europe. 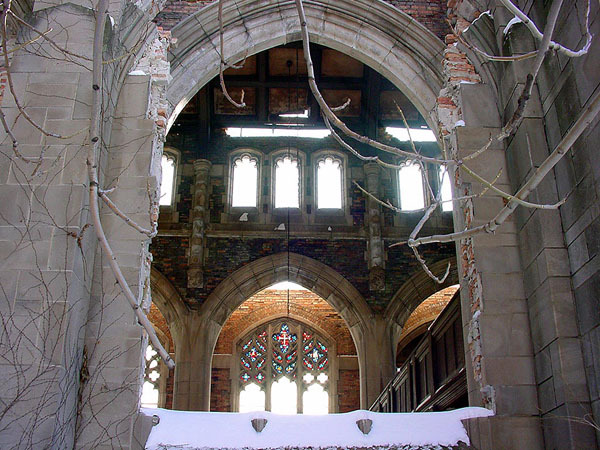 Even in abandonment, this building is beautiful and a source of fascination for many. It has been photographed, explored and documented by countless people. Photographer Robert Perisho dedicated an entire photographic exhibition to the church in 1997 at the Lake Street Gallery in Miller (some of the information on this page comes from his essay and fact sheet on the church). 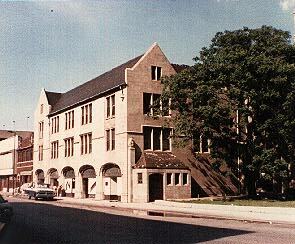 It has also been used as a movie set for films like "Nightmare on Elm Street." Does the City of Gary have any desire to preserve this building? Our thanks to Dan Orr, Wanatah Indiana, for contributing these hauntingly beautiful photos. "I love Gary architecture," writes Dan. "I am using a Sony F505 with a Carl Ziess lens. I like it because it has a 5X zoom, and I can get a lot closer to some of the architectural elements that I like to shoot." The church was built at a cost of more than $1 million by the Rev. William G. Seaman in 1926. United States Steel Corp. donated funds to complete the building. The church is in the traditional English Gothic style of architecture, like some of the buildings that the famed United States Military Academy at West Point and elsewhere throughout the United states. This was, and is, a remarkable building: besides the cathedral, there was a four story community center with classrooms, an auditorium, a motion picture booth, a banquet hall and kitchen, a fellowship garden, a large meeting hall, a gymnasium and a rooftop garden. The building was built to be not only at church, but a place for the entire community to gather. 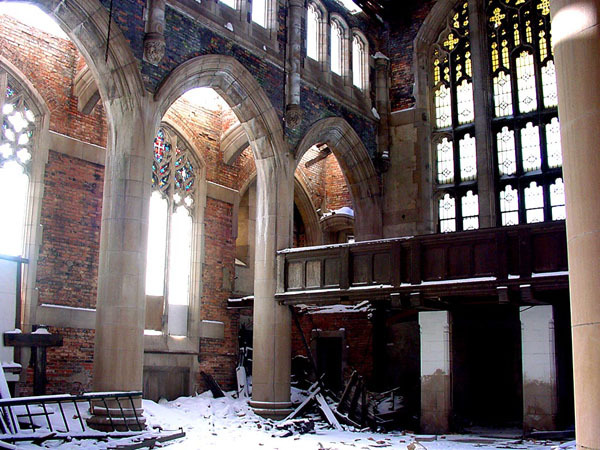 Sadly, due to the shifting population of Northwest Indiana, the congregation of the church shrank drastically in the 1960s and could no longer afford the upkeep of the building. 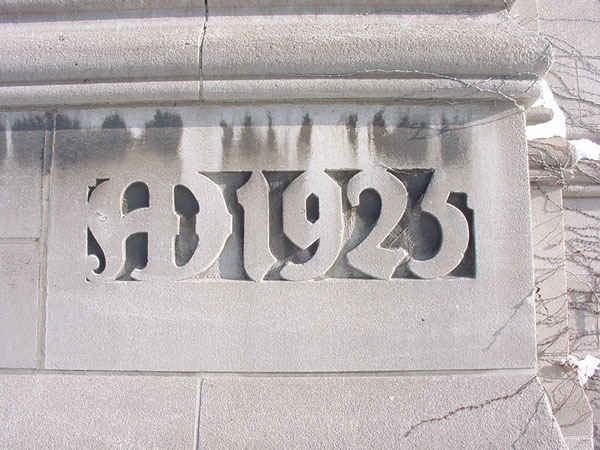 A committee held a meeting in October 1974 to determine the fate of the church. They decided to relocate and close the church as of January 3rd, 1975. The building was sold to Indiana University as a campus extension but nothing was done with it.. The building was used sporadically as church by another congregation, a local dance center and a halfway home for underprivileged children and single parents, but it eventually fell into abandonment and disuse. The building stands open to the elements and vandals. Previously. the building was under the ownership of B&R Realty in Gary, listed to a Trades, Inc. but now may be owned by the city of Gary.